C.S. Johnson has done it again! 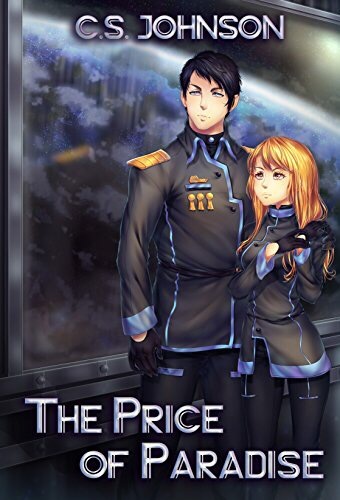 Her third and final installment of The Divine Space Pirates series “The Price of Paradise” had me on pins and needles, holding my breath in anticipation. After books one and two, The Price of Paradise finds our main characters and their allies engaged in all-out war against the URS and her dictatorial ruler Director Osgood. What is the price of paradise? What personal costs would you be willing to pay for the benefit and freedom of your fellow man? After their unexpected reunion in book two, Exton convinces Aerie to marry him. But their marriage is off to a rocky start, what with Exton’s commitment to the war effort and overthrowing the URS and Aerie’s limited knowledge of how an actual marriage is supposed to work, but when St. Cloud reveals to Exton the real reasons behind his father’s assassination things get even harder. Exton begins to question everything. What is the truth? And, if what the General has said is true, what impact does that have on Exton and his life’s mission over the last decade? Aerie knows something is bothering Exton and when he refuses to confide in her she is left questioning their bond. If he cannot trust her, where does that leave them? Things get even more strained when a routine rescue mission, led by Aerie’s mother Merra, leads to disaster. Characters we know and love are lost, leading Exton, Aerie and others to take drastic measures. The allegories laid out by C.S. Johnson throughout this series, but especially here in The Price of Paradise, are thought provoking. Lessons of the past… the idea of children repeating the mistakes of their parents… friends lost or sacrificed… blind love, faith and trust… betrayal and redemption… personal sacrifice for the greater good… These are all lessons we can relate to and learn from, regardless of the fantastical war-torn reality our beloved space pirates inhabit. To say The Price of Paradise is a satisfying conclusion to the series is and understatement. It is, ultimately, a treatise on the importance of love, honesty, and faith in a higher power coupled with hard work and determination to question the status quo. Join the crew of the Perdition HERE and get ready for one helluva ride!